 A debut collection of nine first-person stories, selected by Ann Beattie as the winner of the John Simmons Short Fiction Award for 1997. Lenzo's lighted city is Detroit, where a young woman, not always named but sometimes identifying herself as Annie, describes, in such stories as ``Stealing Trees'' and ``Burning,'' what it was like to grow up there in the '60s and '70s. 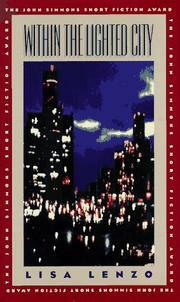 The title piece looks back from a more or less contemporary perspective at the protagonist's life and the city's recent past. The effect is that of a loosely structured short novel. In ``Stealing Trees,'' two teenagers become obsessed with roaming the city to transplant trees to one huge suburban yard, until they are challenged by some tough black kids who think the white kids are crazy. Race relations, which Lenzo treats offhandedly but with insight, are the central theme of Lenzo's best effort, ``Burning,'' set during the 1967 riots. Here, a teenage girl watches her father, a doctor, as he valiantly but futilely protests police brutality. The girl learns the limits of idealism and discovers that, sadly, her father is not all powerful. Race is again a theme in the harrowing ``Self-Defense,'' about a white girl who finds herself under attack in an all-black school, where she masters the adult lesson of how to defend herself. Lenzo's child narrators eventually melt into a young married woman. She's giving birth to her second child in ``Waiting,'' by which time her marriage is already disintegrating. In ``Sophie's Shirt,'' she's a mother mourning the death of her baby. In the contemplative title story, Annie's entire family comes together: brothers in drug treatment programs, all survivors of various disasters; the tough grandmother; and Annie herself, divorced, looking for love, hopeful, but more scarred by life than she's willing to admit. Polished and insightful, but a work that would have been more successful as the novel it almost is.